The dentist can be a scary place filled with strange tools, fun-house-like mirrors and shiny instruments that can lead to nightmares. Despite the beneficial nature of the dentist’s office, this can leave your child scared to go there. To help your child overcome his or her fear of the dentist, here are five things that you can do. There’s a certain point where young children are fearless because they’re inexperienced. It’s this time that their experiences shape their fears, and the unknown tends to be the most fear-inspiring thing. The sooner your child interacts with the dentist, then the less likely they will be scared of them. This will also have the added benefit of less work, which means less potential for traumatic experiences or long dentist visits. Children are naturally curious, so you might receive a bombardment of questions from your child before a visit to the dentist. The best way to handle this is by answering simple questions without giving too much away. The difficult questions should be handled by the dentist. This can acquaint your child with the dentist in a way that paints the dentist as someone they can trust. You might think bringing your child along with you on your dentist visit is a good idea, but it tends to instill more fright in your child than courage. The reason this happens concerns the way you might unconsciously exhibit your own anxieties. 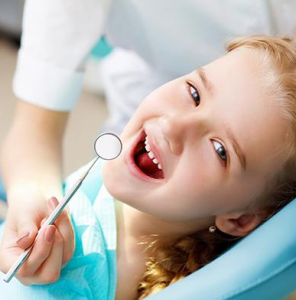 Try to leave your child out of your dentist visits to help them feel better about their own appointments. One way to teach your child to relax when they visit the dentist’s office is to bring something familiar from home. This could be a toy, a book or anything that they can derive some comfort from. Doing this will teach your child that the dentist’s office is a safe, fun place full of positive things. According to Dr. Bryan Murray, the most important thing you can do is to teach your child the importance of good oral health. Teach them what the dentist does and why regular appointments are beneficial to their health. There will always be some fussing from your child when he or she visits the dentist, but it’s your responsibility to make your child feel at ease during an appointment. Just remember that you’re not alone at the dentist’s office. The staff and the dentist should help you out by helping your child understand the importance of dentist visits and feel safe while doing so. I like your idea to bring something familiar to the dentist to help your kids be more comfortable. If I were a kid, I know I would be scared to go to a strange new place and then have someone poking around in my mouth. With my favorite toy, though, I would have at least a little bit of comfort!